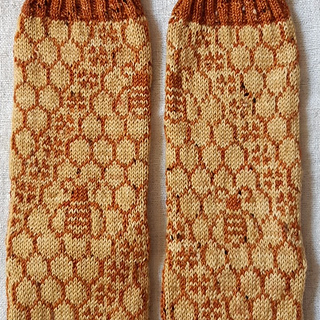 The pattern includes charts to have mirror images on the left and right foot so that one of the bees falls on the outside of each leg. 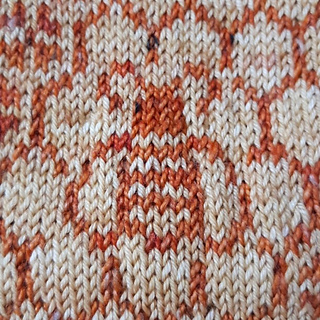 If you choose to, you could duplicate stitch the bees in a sperate contrasting colour to make them stand out even more. 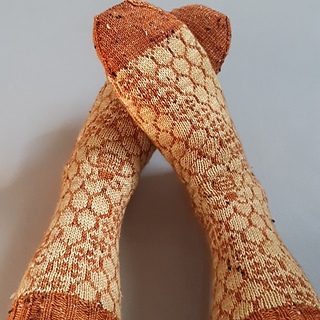 As with most colourwork, you can adjust the fit by adjusting the gauge (by going up or down in needle size) and you can go up to sport or DK weight yarn on a larger needle, if desired, for a larger foot size. 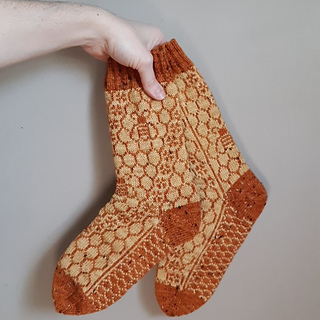 The pattern includes an optional chart to extend the foot if you find you need extra length after finishing the colourwork chart. 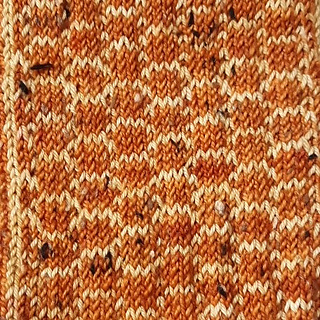 In my sample, I used 162 yds of yellow and 239 yds of orange on 2.75mm needles for the colourwork section, to fit a 9.5” foot. A 100g skein of background and a 50g skein of contrast should suffice for just about any size. 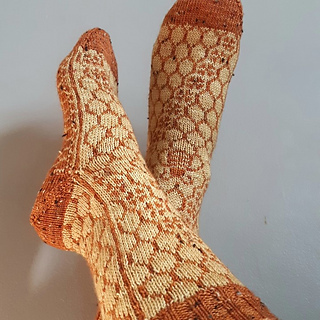 Alternatively, you could use 50 g of each colour with a separate contrast colour for heels, toes, cuffs. 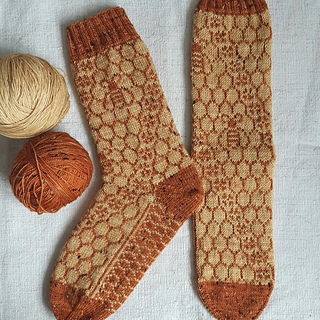 ERRATA: In the FINISHED MEASUREMENTS section, the Length of charted foot section is for chart 2A/2B, not 1A/1B s stated in the pattern. 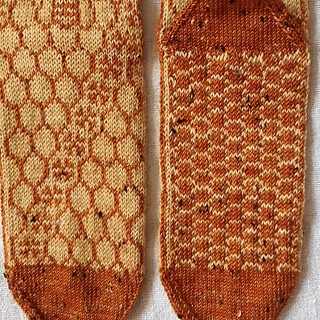 Similarly, the total length of foot including heel and toe includes Chart 2A/2B, not 1A/1B as stated in the pattern. -choose several colours and shapes of plants that flower throughout spring, summer, and fall. Bees are particularly attracted to white, yellow, blue, violet and purple flowers. -plant in sunny spots with shelter from high winds.